Millennials may make different life choices than previous generations, but they are also more engaged at an earlier age with retirement savings in the workplace. A lot of ink has been spilled maligning the Millennial generation and lamenting their motivation to save for retirement and otherwise plan for the future. For instance, it has been written that Millennials are short-term thinkers who prioritize life experiences over saving for the future. They’re also typically described as budget-conscious consumers who have little loyalty to businesses or brands. And, of course, they’re viewed as lifestyle predators, having “killed” everything from condiments to vacations. In truth, Millennials simply make different life choices than previous generations have. One of those choices is saving for retirement earlier—on average, at age 24—than previous generations. A typical Gen Xer began saving at age 30, and Baby Boomers didn’t start setting aside retirement funds until age 35 or so. 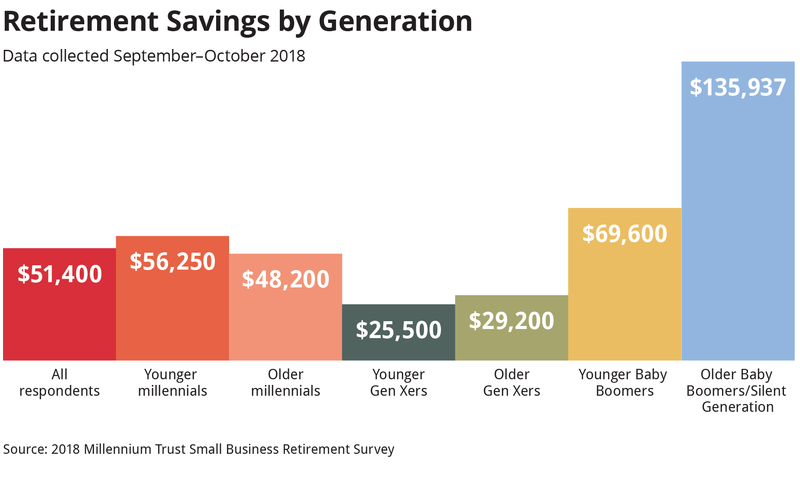 The 2018 Millennium Trust Small Business Retirement Survey found that many Millennials already have accumulated sizable retirement savings, as the chart above shows. On average, Millennials who participated in the survey had saved more than Gen Xers. It is a good thing Millennials are tucking away tidy sums at an early age. While recent reports from the Employee Benefit Research Institute (EBRI) indicate retirement security in America has improved since 2014, those gains are likely to be lost again in 2034 when the Social Security Trust Fund Reserve may be depleted and benefits reduced by 23%. Consequently, younger Americans may need to save more than earlier generations to secure comfortable retirements due to increased life span and overall increased cost of living. In the Millennium Trust survey, the majority of respondents—across generations—indicated that having a retirement plan at work would help them save for the future. Not having access to a plan was seen as an obstacle to saving by some Millennials, as was confusion about how much to save. Plan availability appears to be a key to retirement security. No matter how old retirement savers are or how much they have saved, workplace plans can have a significant effect on saving behavior. The Pew Charitable Trusts reported that Americans who did not have access to employer-sponsored retirement plans were less likely to have retirement savings. In addition, about 40% of Americans who began saving for retirement in one employer’s plan stopped saving when they accepted a position with an employer that did not offer a retirement savings option. 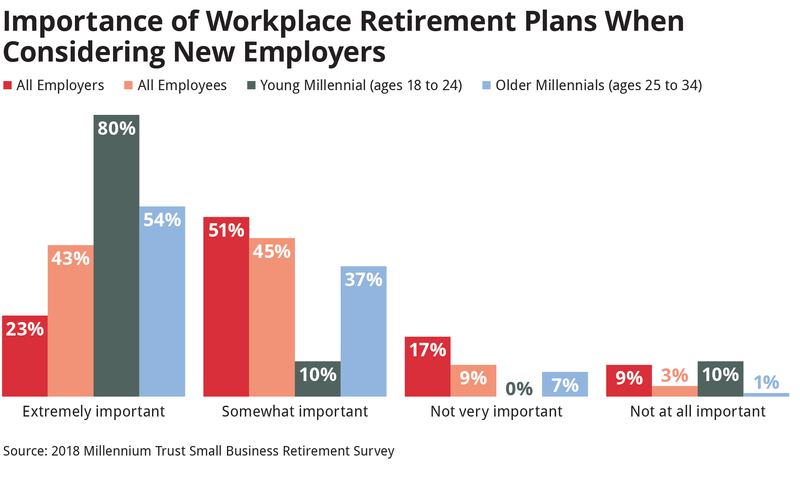 The majority of Millennials consider the availability of employer-sponsored retirement plans to be an important consideration when deciding whether to stay with a current employer. It also is an important consideration when deciding whether to accept a position with a new employer. How Can Employers Help Millennials Better Prepare for Retirement? Millennials have become the largest generation in the U.S. workforce. The Pew Charitable Trusts reported that as of 2017, the most recent year for which data are available, 56 million Millennials (those ages 21 to 36 in 2017) were working or looking for work. That was more than the 53 million Generation Xers, who accounted for a third of the labor force. And it was well ahead of the 41 million Baby Boomers, who represented a quarter of the total. Whether to sponsor a workplace retirement plan. Many smaller employers believe that sponsoring a retirement plan is simply too expensive. Ironically, the Millennium Trust survey found relatively few have researched how much a plan would cost. Understanding that programs tailored to small businesses exist. 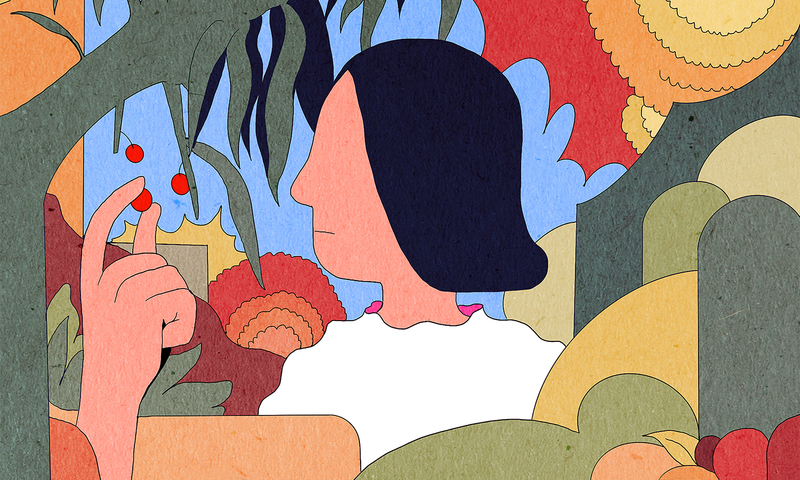 Typically, the costs associated with retirement plans designed for smaller businesses, like SEP and SIMPLE IRAs, are lower than the costs associated with 401(k) plans. Plan participants also usually pay plan costs. In addition, employers may want to consider payroll deduction IRA programs, which are available to businesses of any size and have limited employer involvement. Whether to reduce plan eligibility requirements. Often, lack of participation is not the result of procrastination. It’s due to limited access. Almost one-half of working Millennials are not eligible to participate in employer-sponsored plans because they are part-time workers. There is a potential solution. By lowering the 1,000-hour year of service requirement under the Employee Retirement Income Security Act (ERISA), retirement plans would become more accessible to part-time workers. This would be of particular interest to Millennials, who are far more likely to participate in the so-called “gig economy”. Employers who fail to offer competitive benefits are likely to find themselves at a disadvantage in a competitive labor market. The needs of Millennials, who comprise the biggest portion of the labor force, are particularly important. The importance of portability. According to the Bureau of Labor Statistics, the median tenure of workers ages 25 to 34 was 2.8 years, more than three times less than those aged 55 to 64. Some of that is to be expected, as older workers are likely more entrenched at their places of work. A new paradigm in our labor force. Millennials are more likely to work multiple part-time jobs and participate in the gig economy. According to research from Intuit, the gig economy is expected to make up 43% of the workforce by 2020. For those part-time or contract employees, a retirement vehicle, like an IRA, would provide more portability and flexibility. Expanding workplace options and education. Fifty-five million employees in the United States lack access to a workplace retirement savings option. Of the employers surveyed by Millennium Trust, 64% said their business wasn’t big enough to offer a plan, and 66% cited money as the largest barrier to offering a plan to employees. This data points to a lack of understanding among employers related to plans designed specifically for small business, like SEP, SIMPLE and payroll deduction IRAs. On the flip side, it also points to a need for better communication of these lower-cost plan options on the part of advisers and other providers. The Millennial generation is expected to equal or surpass the size of the Baby Boomer generation over the next two decades, and, as such, will come to define our industry’s sales and marketing efforts. The sooner advisers understand that, the better positioned they will be to take advantage of the tremendous, yet misunderstood, opportunity Millennials present. Kevin Boyles is a vice president and business development director at Millennium Trust Company LLC. He has nearly 20 years of experience in the retirement plan and health savings marketplace. Millennium Trust Company performs the duties of a directed custodian, and as such does not sell investments or provide investment, legal or tax advice. The Millennium Trust Small Business Retirement Survey cited in this article was commissioned by Millennium Trust company, and conducted by CITE Research.